Safety is key when traveling. Whether you’re in the airport, on a plane, in your hotel room or just walking down a new street, it’s important to know you and your possessions will be safe when you’re away from home. 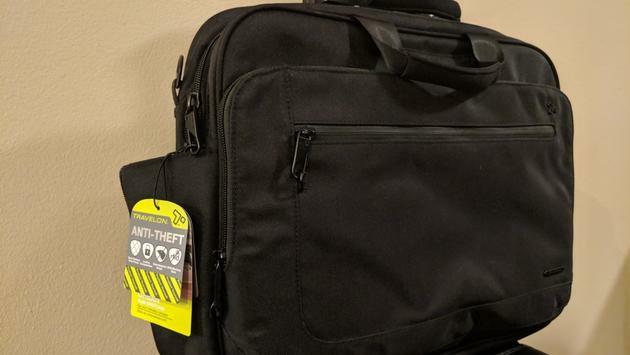 In this technology-crazed world we live in, Travelon has become the leader in anti-theft bags. The Anti-Theft Urban Messenger Briefcase is perfect for the business and tech-savvy travelers. It is made from durable 1260 denier nylon and top-grain leather. Its spacious compartments are designed to keep your belongings from being stolen or compromised. The front compartment has an organizer with RFID blocking card, passport slots, an additional zip compartment for more storage and a padded pocket perfect for an iPad or tablet. When your bag arrives, you will find a little information card inside this compartment that details the importance of having RFID blocking abilities within luggage and how the Travelon product works to keep your identity from being stolen. Another cool feature about this part of the briefcase is that it features a tethered key clip with LED light. So, when you’re looking for personal items and it’s dark on the plane, you don’t need to use your phone flashlight or turn on the overhead light. Simply click on the small but powerful LED light to find that document that’s buried in your bag. For me, it’s typically a pen I need to dig around for. That’s no longer the case now because this front compartment also has a neatly designed space to hold a few pens that I can easily grab upon opening the bag up. The rear compartment has an adjustable laptop protector that holds any laptop up to 15.6” in size. I put my personal Mac laptop in as well as my work pc, and both fit together with ease. Plus, the handle straps make it easy to grab and everything still feels lightweight. You can also slip it over your carry-on luggage handle. It does come with a cut resistant strap that is 14” - 25” in length, meaning you can put this across your body and be comfortable. You’ll also still feel incredibly safe walking around thanks to the slash-resistant body panels and the locking zippers. Travelon designed this bag with safety in mind, but they certainly didn’t scale back on style either. Additional features include a front zip pocket and a mesh expansion pocket on the side of the bag that can hold a water bottle. If you prefer something a little smaller for your laptop bag, check out the Anti-Theft Classic Plus Slim Briefcase. Travelon has a plethora of products from backpacks to carry-on bags to waterproof bags as well as an entire selection dedicated to anti-theft. NOTE: Travelon provided a free sample in preparation for this article.